Keeping up with your personal and business life can be a challenge, especially with the change in years (time always seems to move faster with each new year). Using the any year calendar is the perfect solution to your time management needs. As life gets busier, so does your personal and work schedule. Being able to balance and keep track of work travels and deadlines often cause an imbalance with your personal life activities. It is important to have a customizable, any year calendar to fit your needs and wants at a glance to help you keep on top of your busy schedule. 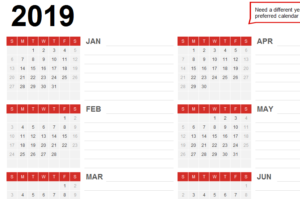 Download the free any year calendar template. You can find the download on this page to get started immediately. This template is very easy, free, and customizable to any year (you will not need another calendar in the future). You can print the entire year on two pages – with six months for each page. Fill out important dates on the calendar. Because this calendar marks the entire year, it will allow you to look at your year-at-a-glance. You will never miss an important date again. Go through the entire year and fill out important events such as birthdays, holidays, work events, and vacations. Filling out this information will help you stay organized and plan accordingly when getting closer to those dates. Remember to balance your life. Add work and social event. Use this calendar as a way to give your life more balanced. Life is too short to work all the time, but requires a balance of work as well. This calendar gives you the power to make this a reality. Keep your calendar close at all times. As the year goes on, you can add more events and plan accordingly. Keep track of what matters to you most. Your any year calendar will make planning easier than ever before, taking the stress of remembering important events away.